· - You do not need any packs or expansions to do this challenge. If you have them that’s fine too. · - No money cheats but as you make money you may upgrade anything you choose. · - You can make money through any means available to you except employment as your elder is retired. · - You must pay bills as usual. · - Ageing needs to be set to normal for your household. 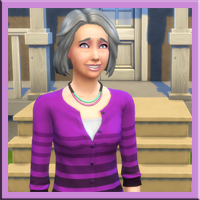 · - Make your elder Sim in CAS. Your choice of traits but the aspiration needs to be ‘Renaissance Sim’. · - Need to move into a starter house or build one leaving enough money for purchasing the things you will need to fulfil the goals below, such as an easel. 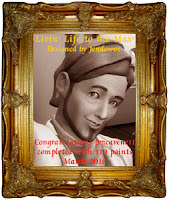 · - Consistently work on your Sim’s needs and wants that appear above their avatar until you have enough reward points to earn the sim potion of youth. · - Repeat this and other rewards as often as you can until your elder’s goals are met. As soon as the goals are met, you must let nature take its course and remember your elder with reverence and pride. - You may bring back your elder from the dead only once if there is a special occasion such as a wedding or birth you would like them to attend. · - All together there are 100 points to earn. To get the total of 110 you must show your elder’s gravestone after they've passed. You can always save her/him in your library if you become attached. · - Follow your elder’s journey with pictures to show the challenge’s goals, some will be left up to your honesty if you can’t show them in other ways. Points to earn are in red. - I will design a reward with your elder's picture for your siggy on completion of the challenge. * Fishing 8 – catch 6 different fish and mount them for display on your Sim’s wall. * Gardening 20 – Reach a minimum of six magnificent plants or better from evolving them, flowers, herbs, trees, fruit or vegetables, this is your choice. Graft five new plants. It is your choice whether you plant them straight into the ground or use a planter. The only condition is they are different species. * Painting 6 – Paint at least one good or better painting from each medium in a mix of sizes. One excellent or masterpiece in any of the mediums. 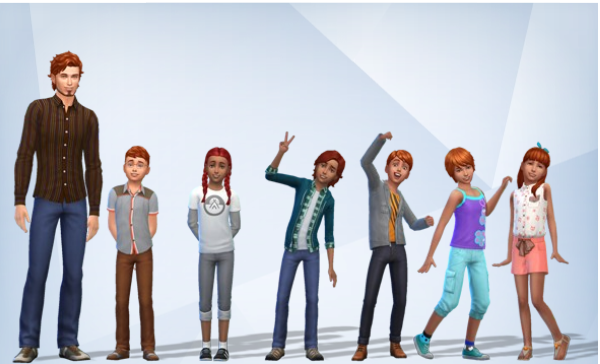 Display these on your Sim’s wall. * Move in a friend 6 - to help with your Sim’s goals. Your Sim does not need to marry or even be romantically involved. Can be any community member. The friend you move in can find a partner to continue in your Sim elder’s home. In addition your elder Sim may find a partner and move them in if they choose. * Cooking 15 – Cook four excellent meals one from breakfast, lunch, brunch, and dinner, six gourmet meals, and if you have “Get To Work” three different types of baked goods. If not add four more excellent meals for a total of eight. All need to be different. * Writing 6 – Purchase a computer as soon as you can afford it and write and self-publish or publish 6 different genre books. * Fitness 5 – Reach level 4 fitness however you choose. * Make minimum of five friends 10 - One from each category; child, teen, young adult, adult and elder. * Photography 8 – Take six selfies in each category of outfit, a picture with each friend you make. Eleven shots in total. If you have the GTW expansion, purchase a camera and use this. * Go on vacation, once if you have this pack 1 - If not, add 1 more thing on any other goal. * Collectables 15 – 3 crystals, 3 frogs, breed 2, 3 fossils, 3 metals, 3 Sim trophies. All need to be different species or types, for e.g. you can’t collect 3 emeralds, all need to be different. Display them so you can take a shot to share in the story. and then put it in your siggy. I cannot wait to try this one! BTW .. I am a "seasoned" simmer too :) so awesome when I find a kindred simmer. Same here. Sounds awesome to do this. Hi Whisper Weeds, If you decide to do the challenge, link me to your progress shots as I'd love to see how you go and if you complete it then I'll make you a signature gift like those above, if you would like one. Link me to your shots and I'll check it out. Will be great to see another person's perspective on how they went about it. Have fun with it, Michele. It's great fun and be sure to link me to the shots you take telling the story of your elder. I'd love to read it. I'm not sure ChelleJo but I can see it with your name. 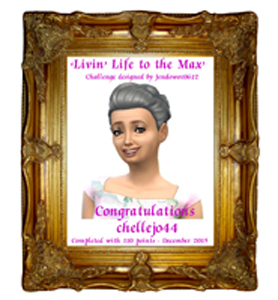 Blogger does some funny things sometimes.Enjoy the challenge, ChelleJo and let me know how you're going and if you made it up as a story. Love to see it. I'm sort of doing a story. I started a blog here on blogger to record my progress. I am enjoying this challenge so much. 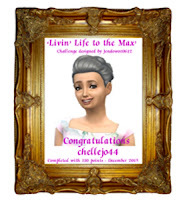 I have literally been playing all day with the exception of writing on my blog for this challenge. I love elder sims, and think they don't get enough attention. I will definitely be saving Ellen (my elder) and playing her more when this is over. I'm already in love with her. :) Here's a link to my blog if you wanna read it (fair warning, I'm not anywhere near writer-mode. This is just me jotting down the story that's in my head for Ellen). It's great, Chelle Jo I've been following every step. I'm glad you are keeping tabs on your points, when I make up a little reward to go in your siggy, I will add the points along with it. I'll have to get you to send me or put a decent shot of your elder here if you can so I can add her to the reward. So glad you enjoyed it Chelle Jo, if you can find that shot I will make you a reward. Also, I have put up another challenge called "Rags to Riches" if you are interested. See above. I completed this challenge. It was heaps of fun. It took me two days to complete. I am very happy with it. Welcome Michele Havens Hope you enjoy the challenges on here. I KNEW I knew you from before .. I was unable to place where but NOW I remember <3 ... the elder challenge <3 AWESOME!